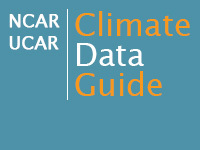 The Climate Data Guide provides concise and reliable information on the strengths and limitations of the key observational data sets, tools and methods used to evaluate Earth system models and to understand the climate system. Citable expert commentaries are authored by experienced data users and developers, enabling scientists to multiply the impacts of their work and the diverse user community to access and understand the essential data. This resource is made available courtesy of NCAR's Climate and Global Dynamics Division and is not produced, owned or hosted by UCAR/COMET.